About Us | Herring & Herring, P.A. Meet the Experienced Lawyers at Herring & Herring, P. A. We are an AV Rated* law firm having represented the injure and accused since 1985 from the Herring Building, centrally located in Sanford, Florida, the county seat of Seminole County. Beginning with Abbott Herring, who was the first elected State’s Attorney for the 18th Judicial Circuit, we have zealously represented our clients for three (3) generations. The decision to hire an attorney is an important one and should not be based solely on legal advertising, so ask about our credentials and experience. At Herring & Herring, we focus on Personal Injury Claims, Criminal Defense and Commercial Litigation. Michael S. Herring, Sr. is a second-generation Sanford attorney who, since 1985, has dedicated himself and his practice to the aggressive representation of the injured, the accused, and small businesses. Mr. Herring’s experience in the civil and criminal courts of central Florida has earned him a high acclaim in the local community and preeminent recognition in legal community. Scott Herring is a calculating, but aggressive attorney with a keen understanding of the law. 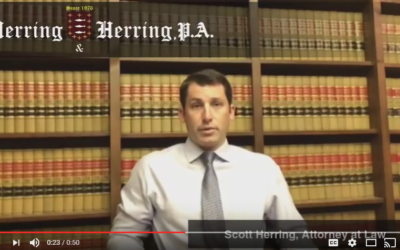 Like the long line of Herring attorney’s, Scott Herring passionately represents the interests of his clients. At Herring and Herring we pursue the most favorable legal outcomes, offering a cost-conscious approach for our personal injury and criminal clients. Our injury case strategy is to never charge more than 1/3 of any recovery even if the case goes to trial and we advance all costs. Our criminal clients receive the benefit of an experienced legal team with reasonable flat rate fees, so you will know what you will owe up front. We provide free telephone consultations 24-7. Since its inception in 1985, Herring & Herring has always placed its clients first.